← 2011: a video summary of the whole year as seen through Twitter – and the growth of Twitter itself too! Another episode in the Browsers war saga. 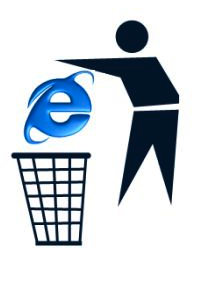 ZDNet reports that Facebook may be phasing out support to Internet Explorer 7 for its latest Timeline. It’s not just that IE7 is aging, 5 years at least, it’s that the Timeline requires the very latest browsers, standards adherence, complex HTML rendering engines and then some. So long IE6 on August 2010 (the chat feature was the latest bullet shot on it), so long IE7 in 2012 since the Timeline is truly technically challenging (if you still have IE7 somewhere on legacy PCs take a look at the buggy output when browsing a Facebook profile). Moreover IE7 currently has a market share of about 4% according to StatCounter; combine this data with the fact the some 30% social networking activity comes from mobile devices, it’s easy to argue that a very little Facebook user-base will be affected by this decision. To those IE7 users: go try Firefox o Chrome or Safari and get a better browsing experience – as well a horde of plug-ins, extensions and gadgets. If the move is intentional, it’s hardly a surprising one. Once, support for older versions of browsers was an important feat for web services, especially popular ones. Nowadays – with many browsers, including IE, being automatically updated for users – there’s little reason to keep using a browser that’s more than five years old. Public statement: I’ve never been a great IE fan, I’ve been using Netscape, Opera, Firefox, Chrome and almost any other browser. IE served me just as a reference when building web sites to see things like most people see them. This entry was posted in Browser, Business, Chrome, Facebook, Facebook Timeline, Firefox, Google Chrome, Mozilla, Social network and tagged Browser, browser war, Facebook, Facebook Timeline, Firefox. Bookmark the permalink.